And rest assured, both you and amma will always remain close to our hearts, and thus will always have our blessings and goodwill. Wish you a wonderful new year Chinmayi. May you find everything u wish and also receive lot more good things in life as you deserve every bit of it. God bless you. You have to sing more songs in Tami especially melodious. I saw some of your interview, its good. Wish You A Happy Tamizh New year. hi there..Wishing u and ur mom a very Happy Tamil New Year!! thank u and God bless u too with everlasting peace, happiness and good health. thanks for your wishes chin. You are blessed to have a mom lyk padmhasini mam. A girl wit beautiful and kind heart. Luv you from the core of my heart. There is no day in which i think abt you. You are my role model for how to be multi tasking, how to be bold, how to care for elders, above all how to be a gud human. 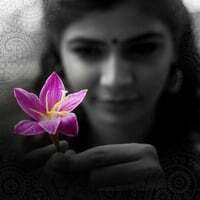 The very quality i lyk in you is chinmayi is who she is. God bless you and padmhasini mam. May this year you will sing more songs and make albums on your own. I wish this year will bring you more recognition by way of awards. God bless chin. wishing you a GREAT year ahead full of love, luck & happppinesssss!!! இனிய தமிழ் புத்தாண்டு நல்வாழ்த்துக்கள் to you too Chinmayi! You have a big 'heart' - wishing all good things for us readers. And may you too be blessed in true sense by the Almighty God. What magic feats or wizardry and voodoo you can do?" You'll be impressed with you." May you 'truly' find out more 'Star Signs' of Truth and be blessed always..! Wish you enough good things to focus on and put your energy into so you can move away from all these people that don't have to put you down. Wish your year ahead is blessed with all that you have said and much more! Just read your because of travels. Wish you too a happy and a prosperous Newyear Chinmayi! May God gives you all the good things in life..let bygones be bygones!! Wish you a happy new year too,Chinmayee. Could you please install a follow widget or an email subscription for your blog. I enjoy reading them but there seems to only be a twitter handle for staying connected which some of us might not be very regular with. Wishing U 2 Good health, prosperity, travel that enriches the being, lovely friends, a loving united family, love, peace, joy & contentment. Believe it or not, not a day goes by without mai praying & wishing for U the very things that U have wished for us all. Advance congratulations for you married life.